The US EPA maintains a list of priority pollutants which results in imposed limits on heavy metal contaminants in industrial wastewaters that are discharged to the surface (including a lake, river, or stream) and Publically Owned Treatment Works (POTWs). Furthermore local municipalities typically impose further and tighter limits based upon local conditions. Heavy metals are generally toxic to all life forms particularly aquatic life to which most POTWs will discharge. Since the local POTW is not equipped to remove heavy metals it is incumbent upon the users of the system to limit heavy metals flowing to drain. Heavy metals exist in two forms: Particulate (either elemental or in some insoluble compound) or dissolved. It is dissolved heavy metals that are most problematic as they cannot simply be filtered as can metals existing in a solid / particulate state. Some heavy metal removal systems, such as two that we discuss here, convert the dissolved metal ion into an insoluble compound, such as a salt, and then filter the salt from solution. Others, such as ion exchange, will pull the dissolved ion directly out of solution, albeit with limitations. Generally speaking evaporation and membrane, often used together, represent technologies not commonly used due to cost of operation, although some applications will lend themselves well to these methods. We will discuss here, at least briefly, metal hydroxide and sulfide precipitation as well as ion exchange as these are commonly used technologies which can be implemented in a myriad of ways. Carbonate precipitation is rarely if ever used exclusively as a precipitation chemistry. However, it can be used in conjunction with other methods, particulatly hydroxide precipitation. In the simplest of applications metals can be precipitated from solution as a hydroxide. Hydroxides are not salts and feature a relatively weak bond between the cation and anion resulting in a compound that is still somewhat soluble (as a function of pH) and one that can disassociate fairy easily. The resultant hydroxide products are denser than water (although only slightly) and can now be filtered via mechanical filtration, or, more conventionally, settled via gravity in a clarifier. Despite the weak bonding energies the resultant hydroxide product solubilities easily lend themselves to discharge permit compliance. As can be seen in the figure above most metals exhibit amphoteric properties in that they have a single pH value at which they are at a minimum solubility. Above or below this pH they begin to dissolve back into solution as free cations. With typical limits for most heavy metals in the range of 0.50 to 1.00 mg / L (ppm) it is evident that most metals can be removed to at or below permit levels via hydroxide precipitation. However, figure 1 only tells part of the story. Once the dissolved metals have been precipitated as hydroxide solids they must now be separated from solution. Discharge permits never specify limits for dissolved metals rather they specify limits for total metals which means regardless of the state of the metal, be it elemental, as an oxide (extremely stable), a hydroxide, or a sulfide, it must be removed from the wastewater stream. This is where the clarification step comes into play. Once the solids are formed they are typically separated from solution via gravity separation. Because of the low density of the solids they are often in solution, sometimes as a colloid, and separation is not a given. A flocculation step is typically employed whereby solid agglomeration is promoted by the addition of a long chain high molecular weight anionic polymer which allows for rapid separation by gravity. In the case of high nucleation rates and high zeta potentials a coagulating agent can be used if the nucleation rates cannot be controlled. Although neutral salts such as NaCl can be used effectively more typically iron salts (FeIII) are used as both a co-precipitating agent and a coagulant. In the case of hydroxide precipitation this is not typically required unless the influent TDS and metal loading is quite low. In order to achieve permit compliance the clarification step must be very efficient and repeatable otherwise breakthrough occurs and effluent metal loading is elevated putting compliance in jeopardy. A final effluent polishing step, usually consisting of mechanical filtration such as bag filters or a multimedia filter, is often employed to capture clarified breakthrough. Ion exchange can also be included in the polishing step adding an additional guard against both precipitation and clarifier breakthrough. The solids that are separated from the clarification step are very low density and consist of 95% (or more) water. The solids and the entrained water are classified as hazardous wastes and must be disposed of appropriately. In order to decrease the cost of disposal (as well as the reportable mass of hazardous wastes) the solids are dewatered typically using a filter press where a dry solids cake is formed and disposed of appropriately. Metals can also be precipitated from solution as a sulfide. Generally speaking sulfide precipitation will allow for much lower residual metals loading under much broader circumstances. A major limitation of any precipitation system, for example, is sequestering of metals via chelating agents such as citrates, EDTA, CDTA, amines, etc. These agents will “capture” metals in a chemical complex isolating them from free anions in solution such as hydroxides. Sulfides have a much higher affinity for cations (metals) than hydroxides and the kinetics often exceed that of the common sequestering agents (albeit not always). Precipitating metals as a sulfide as opposed to a hydroxide will often ameliorate sequestering issues allowing the insoluble salts to form in the presence of the complexing agents. The resultant sulfide products are denser than water (although only slightly) and can now be filtered via mechanical filtration, or, more conventionally, settled via gravity in a clarifier. Unlike hydroxides, sulfides generally form colloidal suspensions due to very high nucleation rates that take additional care and effort to settle from solution. The salts, however, tend to be less hydrophillic than corresponding hydroxides and will form denser sludge cakes in the dewatering process. However, this does not necessarily mean lower sludge volumes, in most cases just the contrary is true. 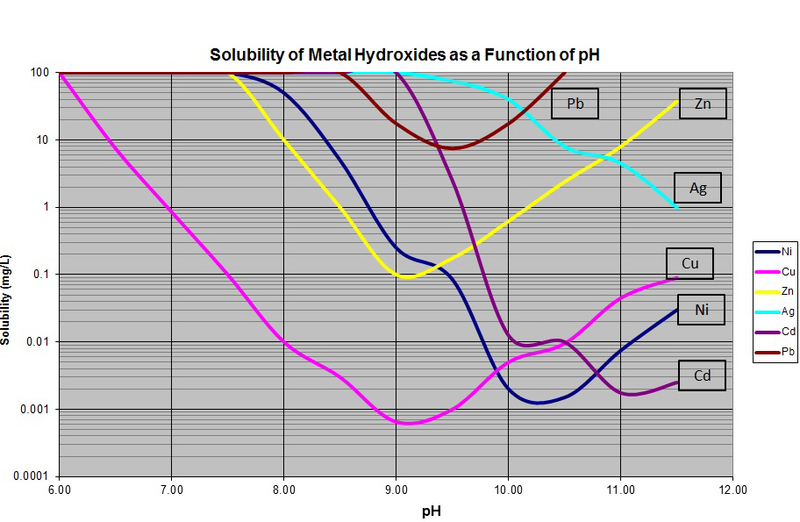 As previously described and as evident in the graph above the solubility products of metal sulfide salts are much lower than the corresponding hydroxide products. The lower solubility products allow for much lower metals loading in the effluent stream and under a much wider range of characteristics (pH range, sequestering agents, etc.). In the photos above a wastewater with a Cu concentration of 300 ppm is precipitated as a hydroxide (figure 4.) and a sulfide (figure 5.). Both are allowed to settle for 10 minutes. In the figure on the left a layer of blue sludge representing ~10% of the sample volume has collected on the bottom. This is a Cu(OH)2 laden sludge that is quite light and easy to disturb. The clear supernatant on top is relatively free of Cu (< 0.20 ppm) and can be discharged directly to the drain. Note: In both cases neither a coagulant nor a flocculant were used. The colloidal suspension in Figure 4. Will not settle without the use of a coagulant to neutralize the zeta potentials and then a flocculant to promote particle agglomeration. In the figure on the right the Cu has been precipitated as a sulfide (CuS) but the sulfide solids have not yet settled as the colloidal suspension is very slow to settle and may not without a co-precipitating agent, or a flocculating agent, or both. Even with the assistance of a flocculating agent the solids will be slow to settle. However, the resulting sludge will be more stable, the supernatant will be lower in Cu (perhaps below non-detect levels), and the process is more immune to interference from sequestering agents. Although, in theory, the CuS precipitation process will yield a denser sludge therefore a lower sludge mass (due to less water being discarded as hazardous waste) such is not the case in practice. In most cases sulfide precipitation is only used in extenuating circumstances (e.g. very low compliance levels or presence of sequestering agents) and a coprecipitating agent such as iron or calcium must be used both of which will add very substantially to sludge volumes. Sulfide precipitation processes must take place at a high pH with high residual alkalinity otherwise the liberation of H2S will occur. The hazards of H2S liberation cannot be overstated and must be avoided due to the toxicity hazards, corrosivity hazards, and the possibility of an explosion. Figure 6 is a process flow diagram of a continuous flow through sulfide precipitation system that would be suitable for flows from 1 GPM to over 1,000 GPM with influent metals loading of 10ppm to 700 ppm (or higher). Although shown as a sulfide precipitation system this would work equally well as a hydroxide precipitation system with a simple change of chemistry. Figure 6 is shown in contrast to Figure 2 which is a batching system. Both have merits: The continuous architecture shown in figure 6 is more commonly implemented but has limitations. A batching system is generally more tolerant of fluctuating influent chemistry, will handle higher influent metal, TDS and TSS loading, and can provide better clarification. On the downside, however, the size will be larger and cost of operation higher as compared to a continuous flow through system. The graph above depicts the approximate cost of operation of a system precipitating Cu from a simple plating solution. In the case of the Hydroxide curves a co-precipitating agent (FeCl3) is used for influent Cu concentrations of up to 100 mg/L, beyond this no co-precipitant is used. In the case of the sulfide precipitation curves a small amount of EDTA is present in the sample which precludes precipitation as a hydroxide. The use of sulfide, in this case, is an imperative as Cu will not precipitate as a hydroxide in the presence of free EDTA. As is always required with sulfide a co-precipitating / coagulating agent is used at all concentrations. This adds to both the cost of operation and to the sludge volume, but it does allow for the precipitation of the target species which would otherwise be impossible. In both cases above an anionic polymer is added to aid in flocculation. In most cases a metal hydroxide precipitation system will suffice in meeting discharge criteria, however, this must be done with the utmost care as any upset condition will easily result in a discharge contravention. A final effluent polishing system consisting of mechanical filtration and ion exchange is often appropriate in providing assurance that the permit criteria are met. In more difficult applications, particularly when sequestering agents may be present a sulfide precipitation system may be the only answer. However, caution must be exercised due to the toxicity potentials. Digital Analysis Corp. manufactures small metal reduction systems suitable for flows as low as a few hundred gallons per day (see photo below) to systems capable of treating tens or thousands of gallons per day.